Do you love the giant boutique bows, but hate the price? Are you a tomboy mom hate to fix your girls hair, and want to buy a big pack to have some variety? Yinson Bows will meet your all requirements. The Bows are made of good quality ribbon and have multiple colors to match variant outfits with. Each bow is 100% handmade, premium quality and unique design is promised. Features: 1. 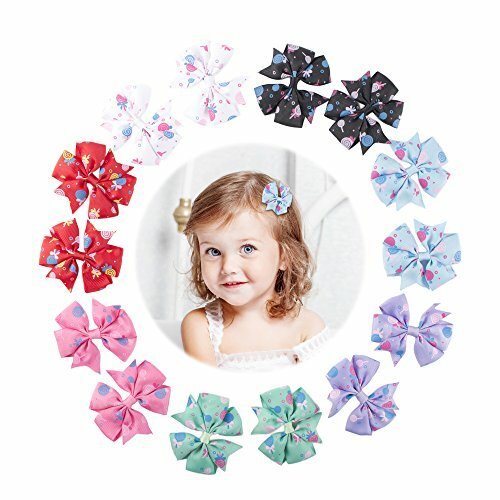 The Yinson committed to provide elegant unique designed hair bows for any occasion; 2. Easy to use; 3. Bundle set with variant design and color; 4. Yinson Bows fit well for baby, toddler, kids and adults. Specification: Material: Grosgrain Ribbon Color: 18 Pieces Size: 3 inches Package Included: Yinson Hair Bows Clips X 18 Please be noted: 1. Minor size error due to manual measurement is allowed; 2. Please be reminded that due to lighting effects and monitor\'s brightness/contrast settings etc, the color tone of the website\'s photo and the actual item could be slightly different; 3. Yinson is a protected Trademark.